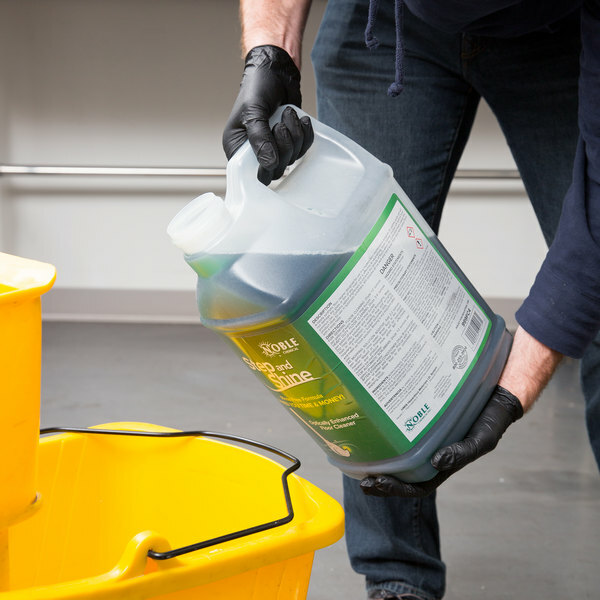 For even the toughest commercial jobs, choose these Lavex Industrial 5 mil thick, powder-free large nitrile heavy-duty gloves to complete the task. "These gloves are such high quality and definately the thickest plastic gloves we've ever used. The large size is great for medium to large hands as they stretch well too"
The large size allows you to have gloves ready for those employees with larger hands. By stocking a variety of glove sizes you can be sure all employees will be able to complete their tasks with ease and efficiency. My staff and I love these gloves, especially for cleaning purposes! Not one single time have they ripped on us, unlike many other gloves. We will continue buying these over and over. We used to buy Vinyl gloves at the local Restaurant Depot, but since discovering these black Lavex Industrial Gloves we will never another glove. These Lavex gloves are very durable compared to other gloves we have used in the past. 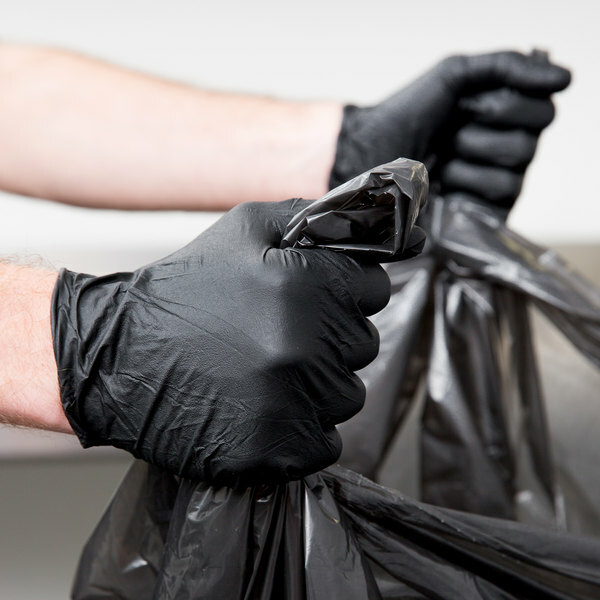 The glove also has many applications we can use them for we mainly use them for food handling and assembly during our shift and for cleaning after our shift. I appreciate that they’re powder free gloves and don’t leave a residue on your hands. The gloves are very durable. The fit is great & i use it mainly for cleaning when i use chemicals or when I’m prepping food. These are awesome gloves! they are strong and reliable, we use these all the time for everything! Way better gloves than all the others i have purchased. I got Medium and Large for my employees because everyone has a different hand size. These gloves are Great quality and great price for what you get. We really appreciate these gloves at our store. They fit tightly with out cutting off circulation and don't tend to stick to the pizza dough while we work with it as other gloves have in the past. Gloves work great for all kinds of tasks from food prep to cooking to cleaning to dishes. Durable enough for the price. And the black looks professional and clean. The gloves are amazing. Thick enough to help dissipate some of the grill heat, hands don't sweat as much in these and they are very durable. 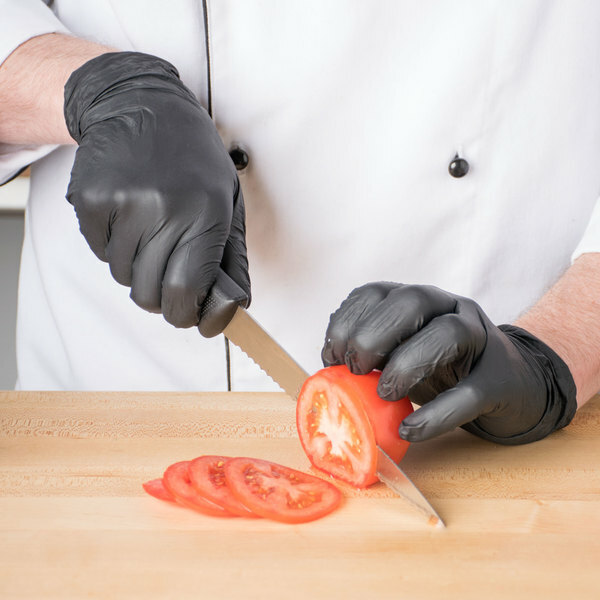 These gloves are perfect for every aspect of food preparation and clean up. Fit is perfect. 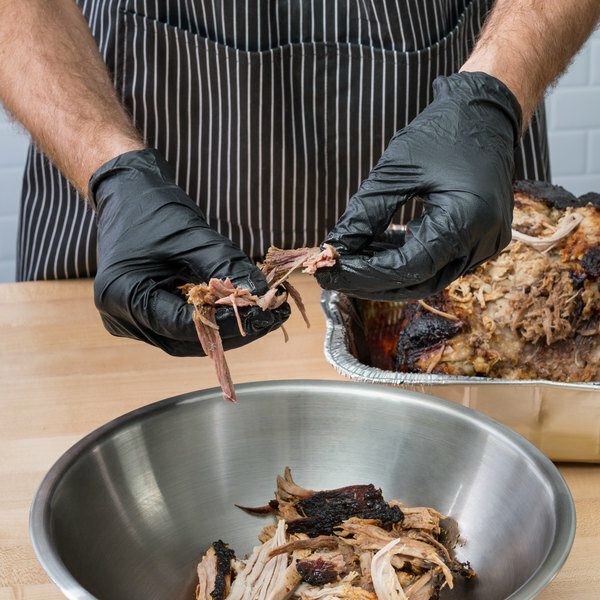 If you wear these over a white cotton work gloves you are able to handle hot foods such as smoked meats. Overall a great product. This glove is a great addition to our kitchen. Our event staff where all black uniforms and look super sharp when they are at a carving station wearing the gloves. We use these gloves everyday and they are a solid, good product. We will continue to keep ordering them. They were shipped quickly and met our expectations! We really like these gloves. They have a nice look and feel to them. You can easily tell that the material is very strong and can withhold anything. I also like these because they don't tear easily which was a problem we faced with gloves a lot. Cool, stylish, effective and allergen safe these nitrile gloves are perfect for any job in food & hospitality. plus, did i mention they look super cool? I had been looking for a high quality glove for sometime. 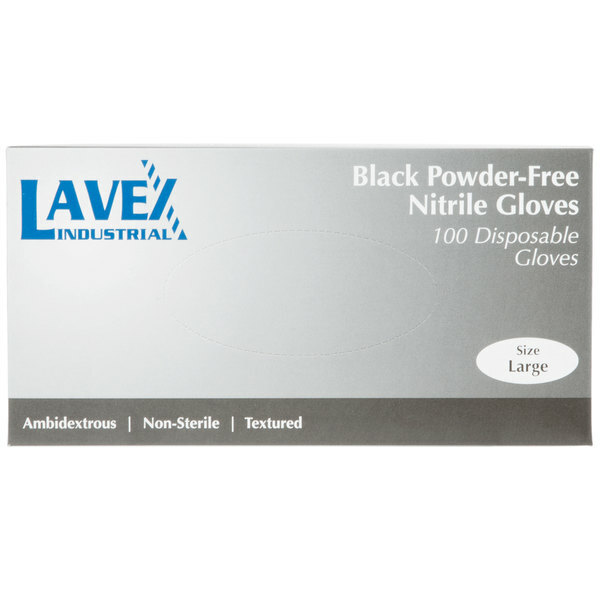 Very grateful I found this Lavex Industrial Nitrile 5 mil thick powder free textured gloves here at a very great price. Will definately get more.?? If you’re looking for a high-quality glove, this one is durable to withstand your everyday tasks. They are great in the kitchen for handling bulk meats. They work well in the garage for handling greasy parts. You can even wear these when handling bulk trash and disposal. The large gloves by lavex industrial are wonderful. They are strong and durable just like the ones I use in medium and small. I never have to deal with them breaking or tearing. Such great quality for such a great price. 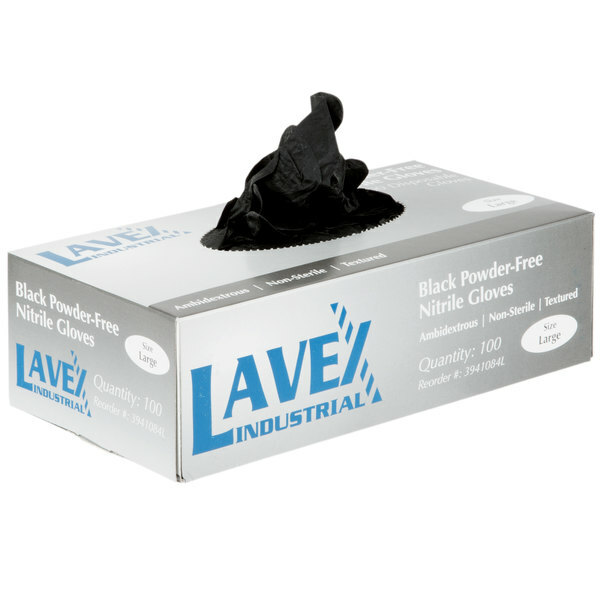 Sir Clean recommends this product Lavex Industrial Nitrile 5 Mil Thick Powder-Free Textured Gloves - Large, very resistant gloves, good quality, good price. we use in our daily activities. 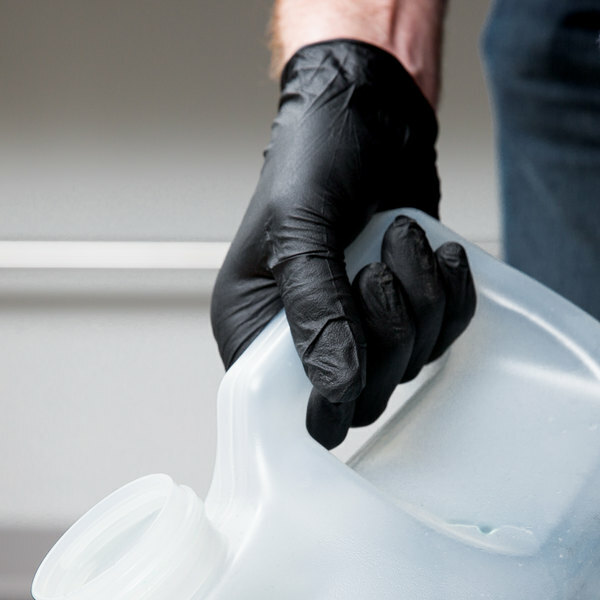 these gloves are really thick and hold up well for many tasks from food service to cleaning or even tattooing. they're super sturdy gloves and its nice that they're also great for people who are allergic to latex.